Before you can connect to a DB instance running the MySQL database engine, you must create a DB instance. For information, see Creating a DB Instance Running the MySQL Database Engine. Once Amazon RDS provisions your DB instance, you can use any standard MySQL client application or utility to connect to the instance. In the connection string, you specify the DNS address from the DB instance endpoint as the host parameter, and specify the port number from the DB instance endpoint as the port parameter. To authenticate to your RDS DB instance, you can use one of the authentication methods for MySQL and IAM database authentication. To learn how to authenticate to MySQL using one of the authentication methods for MySQL, see Authentication Method in the MySQL documentation. To learn how to authenticate to MySQL using IAM database authentication, see IAM Database Authentication for MySQL and PostgreSQL. You can use the AWS Management Console, the AWS CLI describe-db-instances command, or the Amazon RDS API DescribeDBInstances action to list the details of an Amazon RDS DB instance, including its endpoint. Open the RDS console and then choose Databases to display a list of your DB instances. Choose the MySQL DB instance name to display its details. On the Connectivity tab, copy the endpoint. Also, note the port number. You need both the endpoint and the port number to connect to the DB instance. You can connect to an Amazon RDS MySQL DB instance by using tools like the MySQL command line utility. For more information on using the MySQL utility, go to mysql - The MySQL Command Line Tool in the MySQL documentation. One GUI-based application you can use to connect is MySQL Workbench. For more information, go to the Download MySQL Workbench page. The DB instance was created using a security group that does not authorize connections from the device or Amazon EC2 instance where the MySQL application or utility is running. If the DB instance was created in a VPC, it must have a VPC security group that authorizes the connections. If the DB instance was created outside of a VPC, it must have a DB security group that authorizes the connections. The DB instance was created using the default port of 3306, and your company has firewall rules blocking connections to that port from devices in your company network. To fix this failure, recreate the instance with a different port. 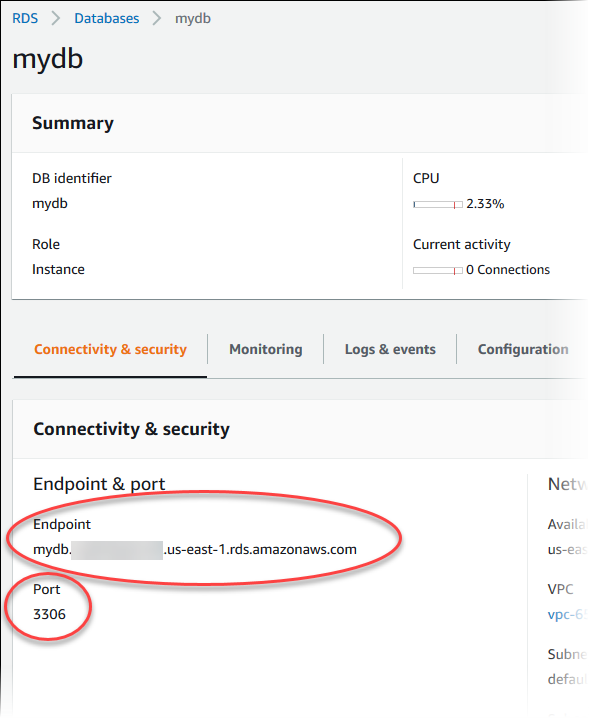 You can use SSL encryption on connections to an Amazon RDS MySQL DB instance. For information, see Using SSL with a MySQL DB Instance. If you are using IAM database authentication, you must use an SSL connection. For information, see IAM Database Authentication for MySQL and PostgreSQL. For information on connecting to a MariaDB DB instance, see Connecting to a DB Instance Running the MariaDB Database Engine. To connect to a DB instance using the MySQL utility, type the following command at a command prompt to connect to a DB instance using the MySQL utility. For the -h parameter, substitute the DNS name (endpoint) for your DB instance. For the -P parameter, substitute the port for your DB instance. Enter the master user password when prompted. After you enter the password for the user, you will see output similar to the following. A root certificate that works for all regions can be downloaded here. Enter the following command at a command prompt to connect to a DB instance with SSL using the MySQL utility. For the -h parameter, substitute the DNS name for your DB instance. For the --ssl-ca parameter, substitute the SSL certificate file name as appropriate. You can require that the SSL connection verifies the DB instance endpoint against the endpoint in the SSL certificate. Enter the master user password when prompted. You will see output similar to the following. The maximum number of connections allowed to an Amazon RDS MySQL DB instance is based on the amount of memory available for the DB instance class of the DB instance. A DB instance class with more memory available will result in a larger amount of connections available. For more information on DB instance classes, see Choosing the DB Instance Class. The connection limit for a DB instance is set by default to the maximum for the DB instance class for the DB instance. You can limit the number of concurrent connections to any value up to the maximum number of connections allowed using the max_connections parameter in the parameter group for the DB instance. For more information, see Working with DB Parameter Groups.